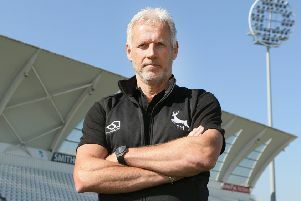 After their record-breaking exploits over the last few days, Nottinghamshire’s cricketers will look to round off a successful week when they face Derbyshire Falcons in the NatWest T20 Blast on Friday evening. The fixture will be the fourth match in a row at Trent Bridge, with the Outlaws having picked up three straight wins to kick-start their season. In their two matches in the 50 over competition they have scored more than 400 runs on each occasion, something they hadn’t come close to doing in over fifty years of limited overs cricket. Before that they picked up their first win in this year’s Blast competition, defeating Lancashire Lightning by two wickets. After registering a glut of runs recently those attending on Friday evening will certainly be looking for entertainment. “Hopefully it will be a warm evening and with a good wicket and a fast outfield they will expect runs,” says Mick Newell, Notts’ director of cricket. Notts will welcome a new face into their side on Friday evening, with the charismatic Andre Russell making his debut for the club. The West Indian all-rounder, one of the most sought-after individuals in the world game, begins a brief stint this week and Newell says it’s a case of ‘see him or miss him’. “He’s here and he’s going to play on Friday and in the next three matches for us but this will be the only home match he plays for us, so this is the only chance for our home supporters to see him in action. “We’re very excited to have him as he’s going to excite people. He is going to bowl fast, he’s going to whack it and he’s an excellent fielder, so we’re very encouraged by his arrival and we’re very pleased he’s here.